Conservation status: Architecture monument of state importance No 6456 (palace) and architecture monument of state importance No.6455 (whole complex of buildings with park). Birini palace - view from south-west. 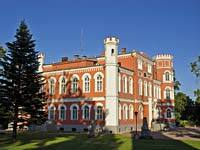 One of the most outstanding and well known palaces in Latvia is Birini palace. During the last decade the palace with surrounding landscape has been carefully restored and maintained. 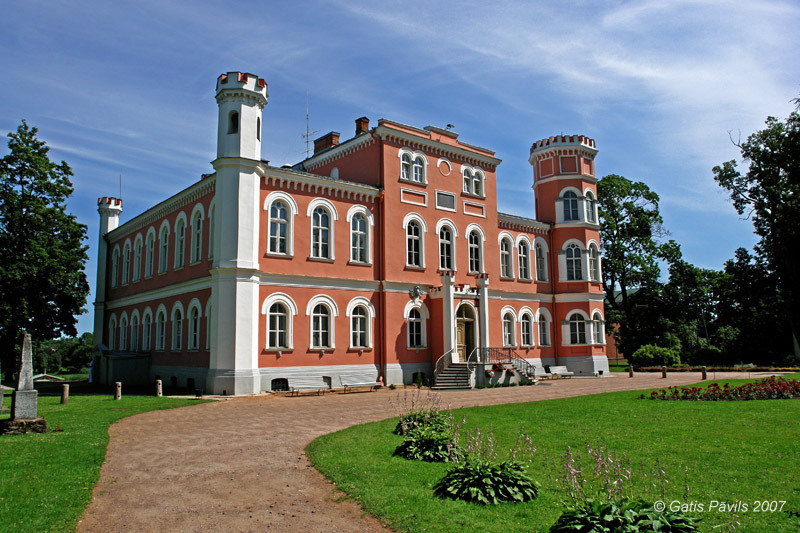 Palace has been built by its owners of a day - family of von Pistohlkors in 1857-1860. Palace is comparatively small but elegant and expressive two - three floor building with carefully planned and transformed landscape around it. Earlier versions of Birini - Koldsell (ancient Livic name), Koltzen (initial German name), Buringshof. Current name comes from the owner of manor in 16th century - Johan Biring. Area of contemporary Birini village was part of Livic Kubesele castle province. In 1574 the lands of Birini were obtained by Johan Biring von Helmstat - his family gave to manor its present name. 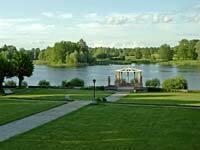 Biring got this manor for his military achievements - he liberated parts of Vidzeme from invaders of Ivan the Terrible and got legendary fame among local people. In 1639 owner of manor became Johann Hindersohn Reiter. Already before him in 1638 there were seven villages of peasants subordinated to Birini manor - including Eikazi village. 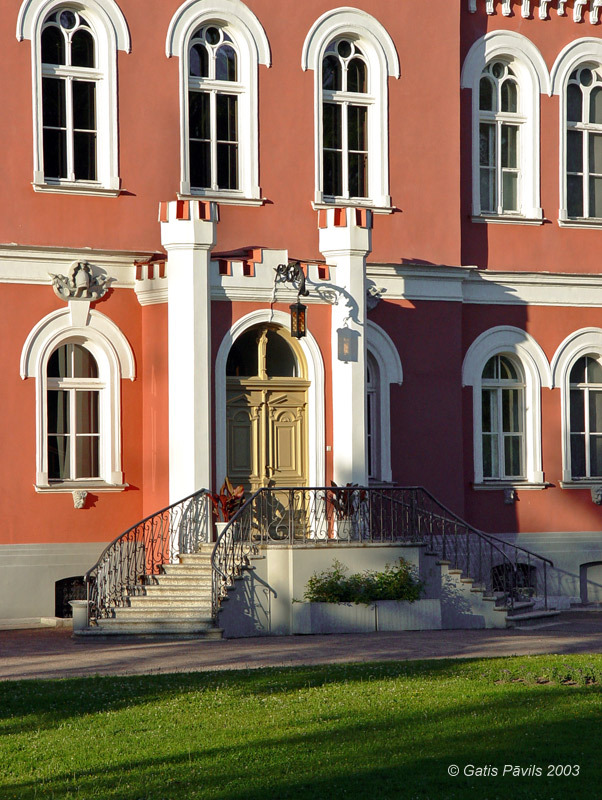 Later owner of this manor was Mayor of Riga Johann Flügeln then from 1662 - Samson family. In 1725 -1782 owner of Birini was Karl Friedrich Mengden - his daughters married representatives of Mellin family. At the very end of 18th century landlord of Birini was Ludwig August Mellin and in his time there started especially active period in economical life of Birini manor. Count Ludwig August Mellin (1754-1835) was an outstanding man. 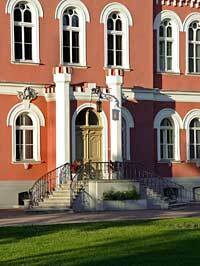 In 1796 - 1831 he was director and president of Vidzeme chief consistory, he was also a magistrate. He was recognised for his work in development of topographic maps including the significant "Atlas von Liefland" from 1797. He was also advocate of peasant's rights and looked for ways to facilitate economical and spiritual life in region. In 1831 he established a reward fund of 1800 thalers for zealous people of Birini. Mellin has been buried in Birini manor tomb - here is also a monument to him. In 1793 - 1795 there was built the old manor house of Birini - long, symmetric one floor building with balustrade and vases on it. In 1813 the manor was granted to Aleksey von Pistohlkors - husband of the daughter of Countess Helena Auguste Mellin (born Mengden). Later owner of manor was his son August von Pistohlkors and during the time of Pistohlkors there continued economical bloom of Birini manor and there were built most of the buildings seen here today - including the palace. August von Pistohlkors married adopted daughter of the St.Petersburg banker L.von Stieglitz - Emilie, and received enormous dowry. He decided to invest it into the construction of new, modern palace. 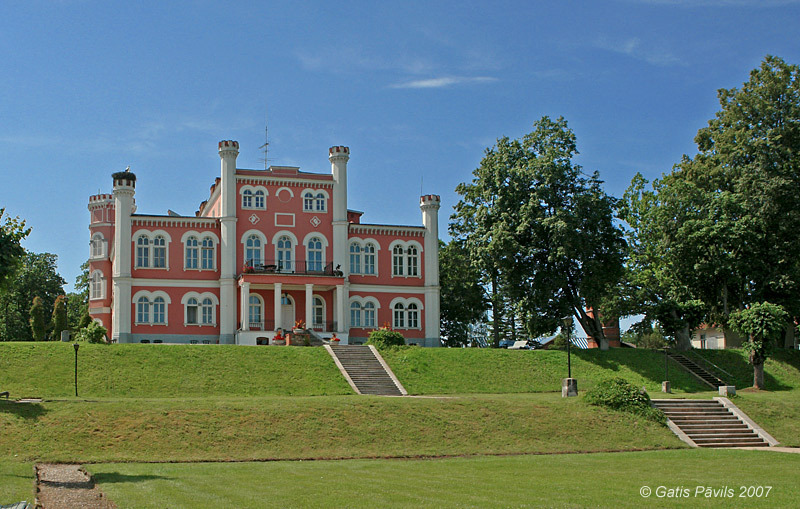 Palace was built by Riga architect Friedrich Wilhelm Hess (1822-1877) in 1857 - 1860. 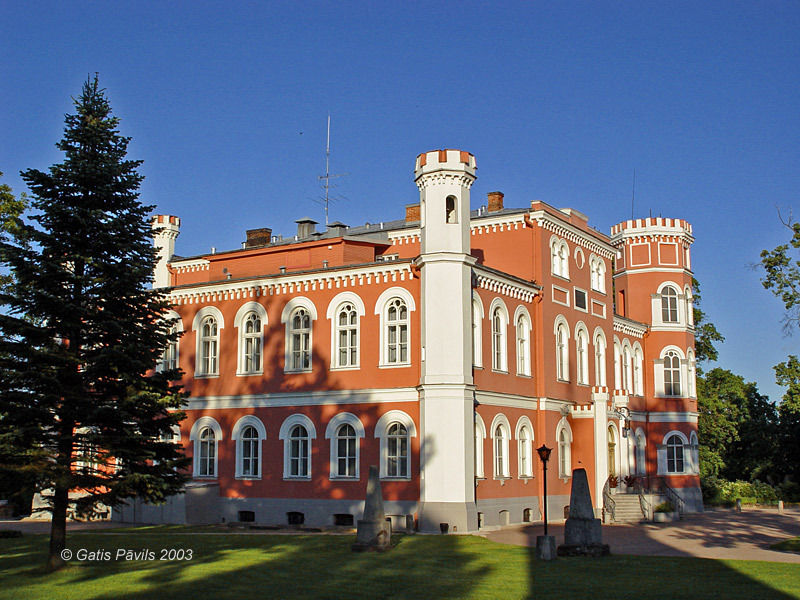 This building was unusually large and ornate for Vidzeme of the times. Sometimes there is mentioned that architect used a ready design from Münich and just adjusted it for this location - but there is no evidence to prove or disprove it. In any way the design of the palace got much praise in 19th century. After the death in August of 1886 the manor was inherited by son Alexander von Pistohlkors. 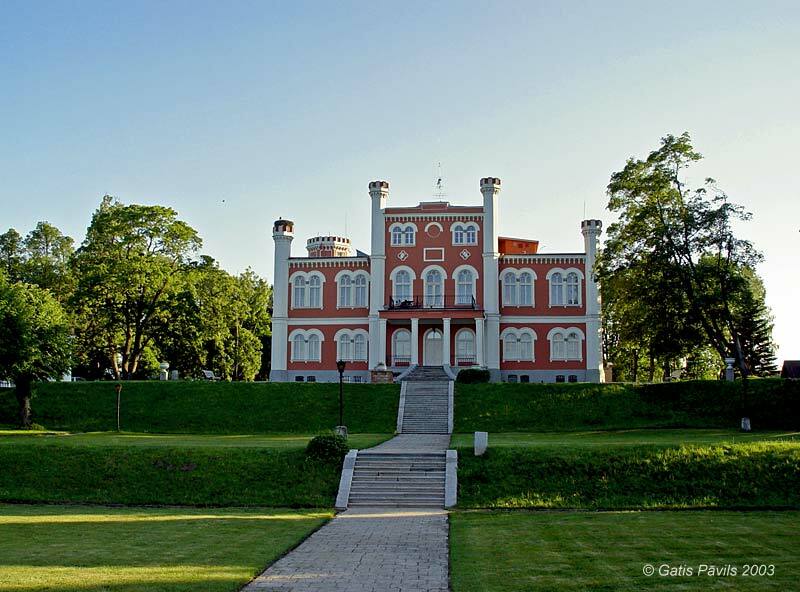 He organised rebuilding of palace in 1870, established a road to Neubad (Saulkrasti) and started to develop seaside resort of Saulkrasti. 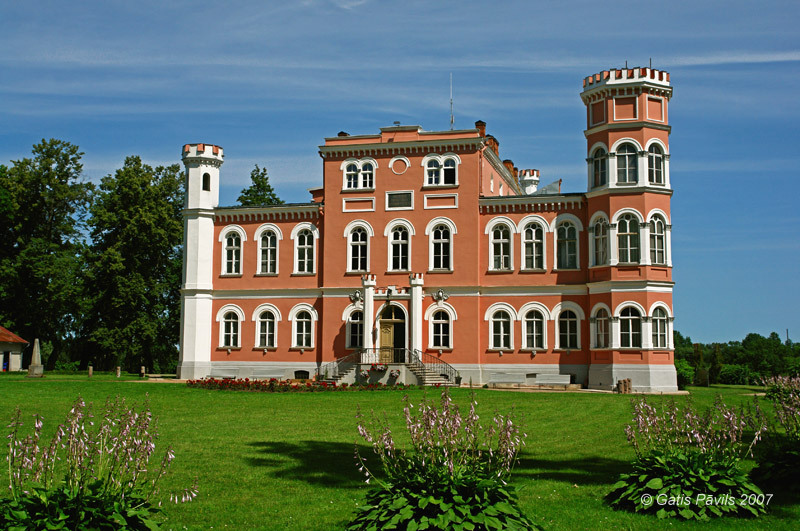 Palace was rebuilt in the beginning of 20th century after the project of architect Rudolf Heinrich Zirkwitz. During these works facade was simplified, made less ornate. Most likely in this rebuilding there were removed also Neogothic tablings - they are remaining only on the large tower. 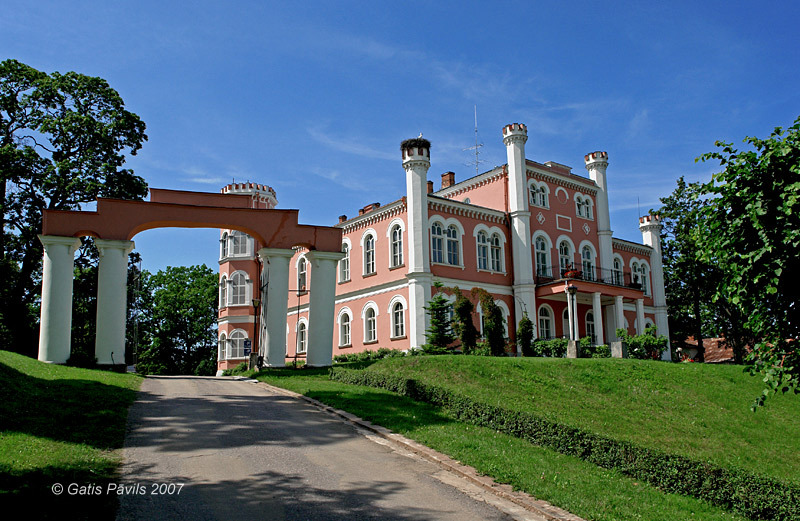 After the rebuilding in 1926 the palace was turned into health resort for employees of printing industry - sanatorium "Gramatnieki". Since this time up to 1995 there were health resorts in the palace. In Soviet times interiors of the palace were "adorned" with painting glorifying Soviet ideology. In 1994 the palace was rented and now it is private property. Palace, buildings and landscape around it have been reconstructed since 1995. There is hotel in the palace and it can be rented for festive events. Birini palace is located near the lake, on the upper rim of steep bank. One of the main facades of the palace is directed towards the nice terraced bank and the lake, but the opposite facade - towards a plain suare with a landscape park around it. Birini palace on engraving. Church tower is visible. Birini palace has got two floors with higher three floor risalit in the centre. All four corners of the building are adorned with towers - three of these towers are small, decorative but southwestern tower is large. Palace is assymetric as it was required by the rules of Neo-Gothic style. But the architect endeavoured to create facade in balanced proportions - thus, for example, eastern half of the courtyard facade is somewhat more narrow due to big tower - here the windows are located closer together but their number is the same as in the other side of facade. Facade towards the lake is adorned with porch and terrace above it. Facade towards the lake is fully symmetric, with paired windows. Although in general the palace corresponds to the canons of Neo-Gothic style, windows have got semicircle lintels which are not characteristic for Gothic style. Thus the palace unites got both Neo-Gothic style and Rundbogenstil. The building has been planned so that its premises are not lined along corridors - major part of rooms are available directly from the vestibule. Interiors of the palace have been made mostly in Neo-Rennaisance style. Arts monument of state importance is interior in three rooms - - vestibule, ballroom and dining hall. Expressive is the interior of vestibule, which is two floors high - this large room is adorned with bilateral staircase and balconies. Ceiling is covered with ornamental paintings. Very ornate is ballroom in second floor - here walls and ceiling are covered with ornamental paintings. 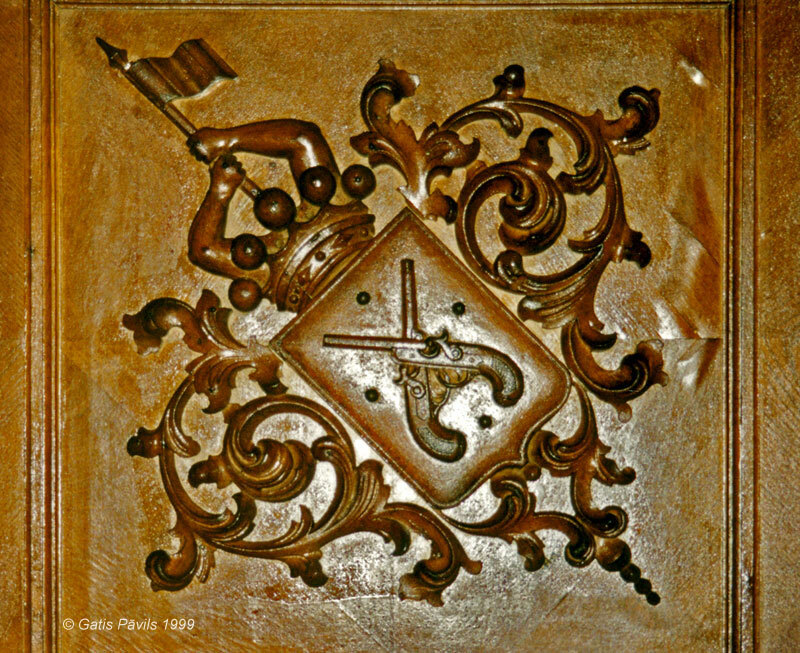 Ceiling of the dining room in the first floor is adorned with cross-wide wooden beams with ornate panels in between - some are adorned with coats of arms of von Pistohlkors family. Valuable monument of art and and craft is inlaid door sleeves with candelabrum motive, ornate stoves and fireplaces. Wallpaper has been obtained in Paris. 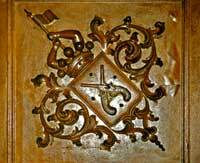 Birini palace, coat of arms of von Pistohlkors family in dining room. There have been preserved catalogues from second half of 19th century listing books in the library of palace as well as art values in the palace. This list includes works of Titian, Rembrandt, Raphael and van Dyck (most likely - copies). In the palace there were also some 30 paintings by uncle of August - Ottho Friedrich von Pistohlkors and paintings by popular painters of time Johann Friedrich Tischbein and Angelica Kaufmann. Initially, up to the rebuilding of early 20th century the facade of palace was covered with numerous decorative elements. Thus, for example, at both sides of entrance there were sculptures of tiger heads by workshop of M.Geiss, above the entrance there were military trophies. At the facade closer to the gate there was a figure of allegory of Peace by Christian Daniel Rauch. 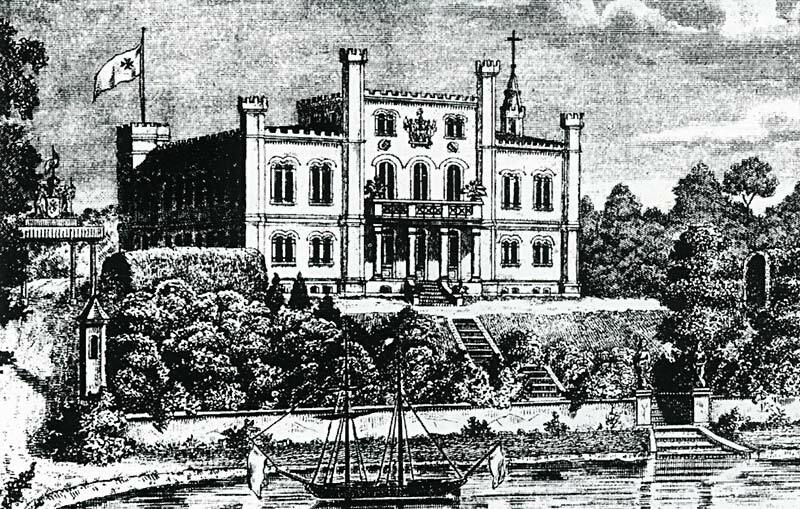 Facade towards the lake was adorned with two Neo-Gothic quatrefoils with the dates of the manor house construction. There was also enormous coat of arms of Pistohlkors family (by renowned Berlin sculptor I.Schroeder) held by two life-size figures. Earlier palace had also a chapel with pointed tower - now both the chapel and tower are lost. Still up to this day there exist masks symbolising the human vices and virtues below the windows of courtyard facade. Outer door-handle of palace is equal to door handle of Berlin Palace. Courtyard facade has got also a marble plaque with Latin inscription: "Relinque infantibus amorem patriae" - "Am leaving to descendants the love for the fatherland". Owner of the palace in early 20th century was Alexander von Pistohlkors and his wife Eleonora - they had two sons and a daughter. Brothers Erix and Max were good friends, they learned together in local school and later in university. Max departed to Caucasus and perished there in 1911. Death of brother staggered the merry and social Erik - he fell in blues. Thanks to the care of relatives Erik slowly recovered. There was a lot of merit also to maid of her sister Renata - lovely and sincere girl. Erik and maid fell in love. But as Erik announced to his parents about a wish to marry simple maid, his mother decided to exclude such possibility. She decided to disgrace the girl so that she leaves the manor. Eleonora organised departure of Erik and made a false letter from Erik informing poor maid that Erik is leaving to marry another girl of his estate. Mother of Erik did not know that maid was pregnant. Maid could not survive the disgrace and hung herself. This tragedy made Erik mad and he shoot himself in the park of palace in 1912. There are told stories that spirit of unhappy maid appears in the palace in full moon nights. Birini palace - view from the lake. Birini palace - view from the park. Birini palace - view towards lake. Birini palace and courtyard gate. Zilgalvis J. Neogotika Latvijas arhitektūrā. 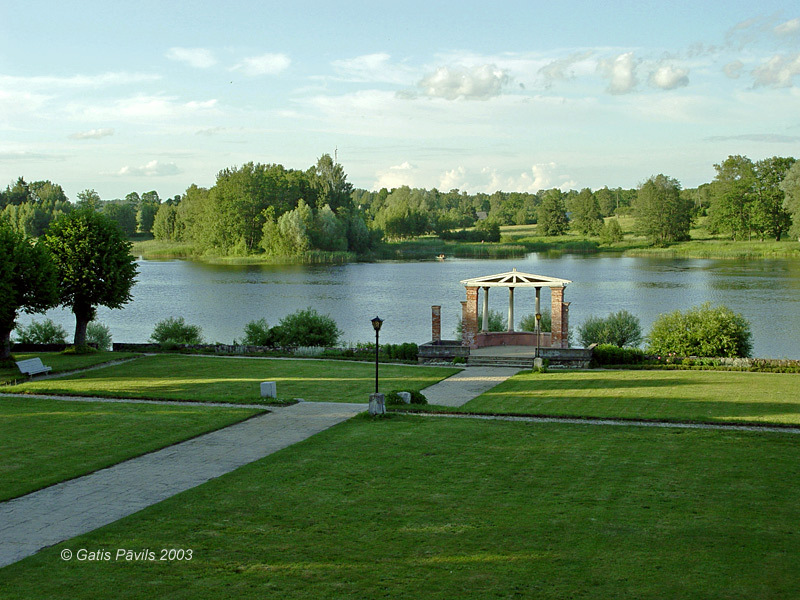 Rīga, 2005.